After dozens of hits, multiple albums and decades in the music game, Joe Thomas is practically a one-man institution. Men keep his catalog on deck for getting the mood right and their ladies continue to swoon over his tender vocals and live stage shows. 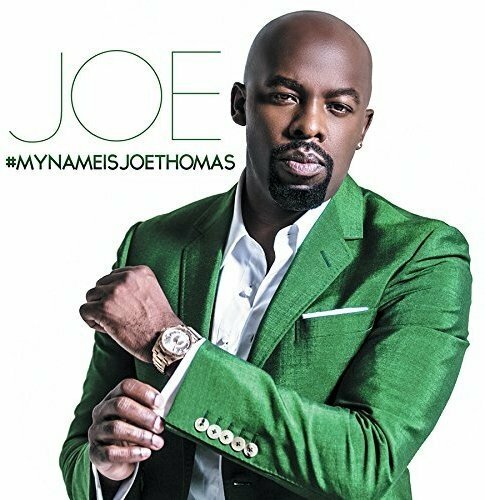 He's a rarity in R&B----sensual without sleaze and gangsta without the gimmicks (i.e., his vocals gracing the theme song of 50 Cent's cable drama, Power), so his longevity might make the title of his latest CD, #MyNameisJoeThomas, a puzzling choice. Perhaps he feels that his thirteenth studio release, with good reason, is finally his career's personal best. What the sixteen tracks will demonstrate, beyond Joe's trademark finesse and sincerity, is his understated intensity and ease with a variety of styles and subject matter; Damo Farmer, Derrick "D.O.A." Allen and Gerald Issac anchor his explorations into both the familiar and unfamiliar. We know Joe is proficient with the boudoir skills (“Lay You Down”) and putting the ladies on a pedestal (“Celebrate You”), as well as pleading his case for happily-ever-after ("Lean Into It"). The swagalicious "No Chance," is a declaration to a neglected woman that her current man will become an afterthought once she switches teams: "You was wastin' so much of your time tryin' to make him see, but he's just not me/He started the war, now he's a casualty, I'm the result of what used to be." Folks long knew of Joe’s gospel leanings via his GA roots, but “Hollow” is a pure country midtempo and well-done rendering at that. Hip-hop surfaces in the Gucci Mane feature, “Happy Hour,” and only Joe could inject Adele’s “Hello” with an added dimension of anguish and despair. Many would see that remake as a bold choice, but Joe presses the envelope even further with “Our Anthem,” a retro-soul mashup of Francis Scott Key and Otis Redding. Interpolating verses of the National Anthem with the cadence of “Try A Little Tenderness,” “Anthem” will be an odd conclusion for some listeners, but its message of unity, especially after the brutal election cycle we’ve just emerged from, is certainly a welcome one. “Girl if I wrote a book you would be my last chapter/Got me sad like when Joe said this was his last album.” Gucci Mane could be telling the truth and Joe could be positioning this namesake set for his exit. We can only hope, however, that #My Name Is Joe Thomas is yet another intriguing episode in the series…..not its final encore. Highly Recommended.